Call of Duty may be falling behind in sales but there is no denying that Black Ops in 2010 was a true breath of fresh air for gamers everywhere, Black Ops made amazing changes to Call of Duty like never before with the introduction of Wager Matches, Combat Trainning and the best of all being the Zombies game mode which gave players the World at War Zombies experience an unforgettable experience followed by plenty of DLC maps which were definitely worth the purchase. Black Ops 2 has been the long rumored yearly title for the series but so far Activision is mum on the issue and so far a new Poster has come to light showing that the game might come out earlier than expected? While I am all for pointing out the cons of Call of Duty games of today I have to give credit where it is due, while Black Ops was just another Call of Duty it did more than a simple rehash of a previous game in terms of content (single player + multiplayer + 1 co op game mode). Black Ops went above and beyond the “Call of Duty” and gave players amazing content which they never got before and even the return of a personal favorite game mode called “Zombies” which has its own story line carrying forward from World at War and even concludes in Black Ops DLC maps. While the story line was also satisfactory the ending left players desiring for more, but it seems that Black Ops 2 might just be the next Call of Duty installment for 2012, if you consider it then it is pretty plausible especially after the ending of Modern Warfare 3 maybe Activision is looking to make more big bucks off the franchise while they can? If Black Ops 2 is as amazing as the first game in terms of additional content then I am sold on this game because Black Ops by far was my favorite Call of Duty in a LONG time. 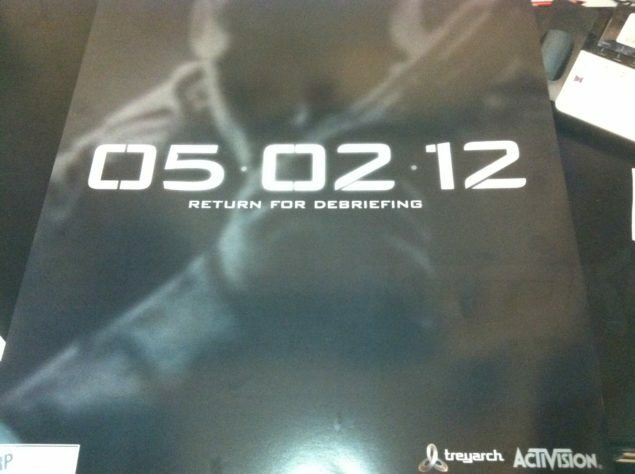 While the poster says May 2nd 2012 (Which is a VERY unlikely date for the release of a Call of Duty game) it could be the date of the reveal of the game too? because releasing a game only a month (less than a month now) without any promotion or advertising or any official confirmation is very unlike Activision and I am pretty sure that it’s a reveal date, but then again this IS a rumor and there is nothing known for sure yet. Rumor: Call of Duty Black Ops 2 Multiplayer Details and Release Date leaked?